Gold is stuck between 1208 and 1212 after FOMC. I decided to try with long now, this is why. You can see the support at 1208 is hold on the way down for now, H1/MA200 is here too, up trendline as well. Resistance at 1212 is holding on the way up and that’s Daily MA100 what is the ‘problem’ for gold in the last two days. Another ‘problem’ for the bulls is Daily MA200 at 1215 as well. This could be the hard batlle and it’s risky trade as I see it. The bulls must react soon! 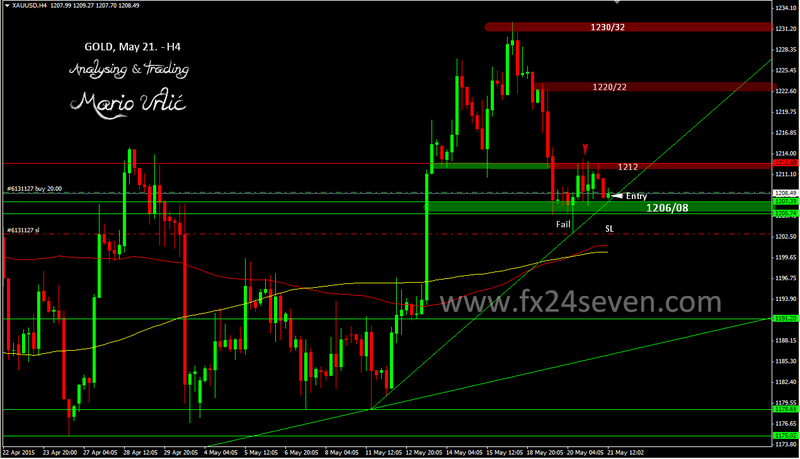 My entry is at 1208.70, SL is placed at 1203, the previous low (fail brake) from yesterday. Risk on my capital in this trade is 1,1%, I didn’t set my target yet. Let’s see can the bulls reach and brake 1212 first!? You understand me wrong I guess. I don’t know your win ratio, but risking an averga on 1% on any trade is taking very big risks in the long run. Institutional investors risk max 0.25% on 1 trade. Imagine you have a losing streak of 10 trades. You still would be confident in your system? With such tight stop-losses it is recommended to use lower risk % because you can let your profits run if it goes your way. Fx trading isn’t a sprint, it’s a marathon. Sorry, I didn’t manage to answer yesterday. First, I am not an institutional investor, I am a single individual trader. Second, that’s why my RR ratio is huge, it wonders me how you didn’t see that in my previous trades and setups. My setup is usualy minimum 1:5 all the way to 1:10! I can close the trade before target, but I will never enter in the position if I don’t see that potential. So, if I lose 3 or 4 my trades I will cover that with only 1 good. It doesn’t matter even if I lose 10 trades, but that scenario is almost imposible. That’s it for now. Thank you for your comment. Risking 1.1% on a trade with such a tight stop loss, isn’t that too much risk for a professional trader? Can you make a analysis on GBPNZD please? If gold catch my SL it could go lower, there is no point to risk 2 or 3%, why?